Let me introduce you to the Amazing Abby Brockway. She is the first of our new Earth Keepers and here is how that came to be. tripod 18 feet high above them. 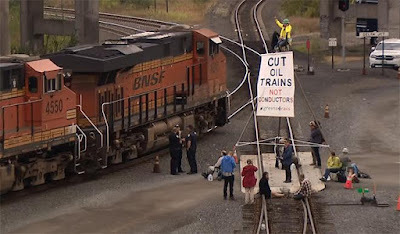 That same young woman sat atop that tripod blocking a train at the Delta switching yards in Everett, Washington. The five of them were arrested and spent the night in jail. They were charged with trespass and delaying a train. January 11, 2016 their trial began. The day before her trial Abby Brockway, ruling elder, gave the sermon at her church, Woodland Park Presbyterian. While she was speaking, John Fife, founder of the sanctuary movement in the 1980s, was across town addressing another Presbyterian congregation. John said that the Presbyterian Church is very good at reform. He said that the Presbyterian Church is amazing at charity. Who does a better bowl of hot soup and a warm blanket? He said that Presbyterians are articulate and energetic advocates on issues that span all of our global concerns. He said that isn’t enough. In order for the Presbyterian Church to be relevant to those who are inheriting our damaged earth and to make the issues move forward in a gridlocked Congressional world the church must resist. The fourth step, the next step, is resistance. Well, it might look like Abby Brockway sitting at the defendant's table during a recess with her almost-as-big-as-she-is daughter on her lap. It might look like recess in a courtroom filled with chattering people and that same young woman standing and asking that all who are present join her in a silent time of reflection for the defendants. The resistance that John Fife proclaimed and demonstrated in his work with the sanctuary movement is the resistance, in love, that Abby Brockway is teaching us in Seattle.